“Through this book, one understands incredible personal and group experiences that would have gone unnoticed. I have never found a book that encompasses the past and the present like Christian Faith among the Jieeng,” Adit Abit, Vancouver, Canada. In Christian Faith among the Jieeng, Rev. Nathaniel Athian Deng Mayen provides an insider's perspective on the development of Christian faith among the Jieeng (Dinka). Based on his teaching and clergy experiences and observations, Rev. Athian discusses the stages of faith, the shift in values and beliefs, and the cultural and religious experiences of Jieeng believers in the Episcopal Diocese of Bor. 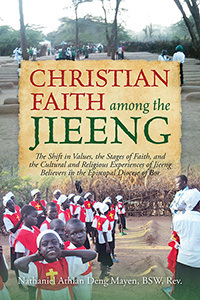 The author maintains that the shift in Jieeng cultural values and the subsequent conversion to Christianity are a result of the believers' experiences and encounters with God. God mysteriously reveals Himself to the animist believers and wins their hearts through the miracles and significant life events. Thus, the miracles and significant events reveal the powerlessness of the animist deities (jak) whom the believers consequently abandon and embrace Christianity. Having no more cattle and grains to sacrifice and appease multiple communal jak, the believers abandon jak and give complete loyalty and trust to Nhialic (God) who requires no appeasement and sacrifices during such scarcity. Christian Faith among the Jieeng is an observatory, experiential and introductory discussion that opens up conversations about Jieeng spirituality in the context of Christian faith. The book draws attention to cultural teachings about social relationships, youth responsibilities, women’s leadership, and the role of leaders in guiding the faith and behaviors of the believers. The author has elaborated that there were no, or limited, denominational conflicts and differences at the early stage of Christian faith among the Jieeng. The conflicts in the Church later resulted from leadership wrangles among the leaders, leading to increased defections to and from the Episcopal Church because of the development of theological and ideological differences over time and the targeting of some dissenting voices in the top Church leadership. These leadership and ideological conflicts reveal elitism, doctrinal, fundamentalism and celebritism stages of faith. The book also discusses the following questions. Is Christianity the existence of God or a colonial tool to disintegrate indigenous cultures and values among the Jieeng? Why is Christianity miraculously taking precedence over indigenous religions and animist worships? What happened after the Jieeng believers in the Episcopal Diocese of Bor preferably embraced Christianity and abandoned their animist deities and divinities? Rev. 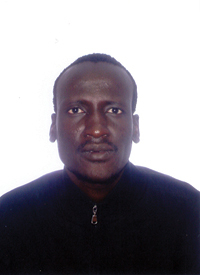 Nathaniel Athian Deng Mayen started teaching in the church at the age of thirteen. He served in the Episcopal Diocese of Bor and the Sudanese Congregation in Kenya for twelve years before he migrated to Canada through the World University Service of Canada scholarship in 2010. Athian holds a bachelor of social work from the University of Regina, and is currently a student in the Master of Public Administration (MPA) program at the Johnson-Shoyama Graduate School of Public Policy, University of Saskatchewan Campus. Rev. Athian enjoys working with communities. His passion for community engagement and development explains why he started developing a career as a teacher, a clergy, a social worker, and currently, a student in the MPA program. Athian lives in Saskatoon and can be reached at nadeathiand@gmail.com.